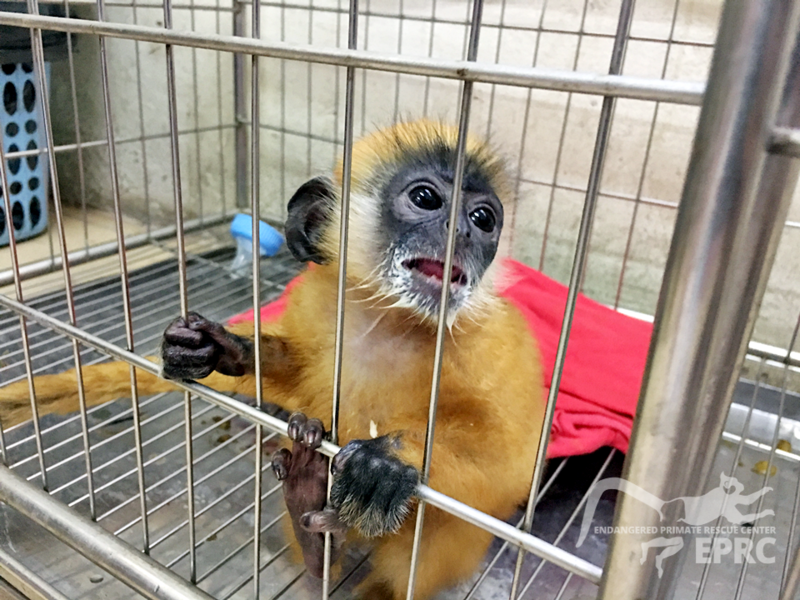 On September 26, EPRC received news from Education for Nature – Vietnam (ENV) that there is a baby langur kept as a pet at a household in Long Bien, Hanoi. The policemen in the area found this baby and after recognizing their faulty action, the household surrendered the baby to EPRC. Sonya Prosser – EPRC Director went to rescue the baby by herself. The species of this langur has not been identified yet, but hair and feacal samples have been collected for DNA analysis. We will let you know about her species as soon as it is identified.This household wanted to purchase a rhesus macaque, and an online seller offered this baby for 3,5 million VND. For 3,5 million VND and a selfish desire, humans completely ruined this little baby’s life! Her parents might have been killed 🙁 We truly hope that this family does not continue to bear the intention of keeping wildlife animal in their house anymore! The baby langur is quite small, yet in pretty good health condition. Please do not let this action continue! If you see that your friends or family wanting to purchase a wild animal, tell them to enter EPRC Facebook and read sad stories about confiscated animals. fill in this form to report any wild animal crimes in Vietnam!